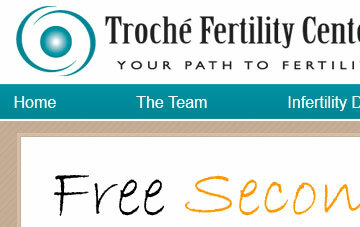 Since 2008, Fertility Marketing is in charge to increase Troché Fertility Centers' (formerly West Valley Fertility Center) patient volume using the Internet. Before hiring Fertility Marketing, the clinic had a great reputation for its IVF success rates. However, the high competition for fertility patients in the Phoenix, Arizona area made it difficult for Troché Fertility Centers to establish itself at the top. A website redesign in April 2008 started to compete with the major local clinics for Google's top organic key phrases within weeks. The clinic also expanded its egg donor program, which was jump started via an optimized paid search campaigns (PPC)..
"Fertility Marketing is unlike any other marketing agency we have worked with before. Their professionalism, expertise in medical marketing and dedication to our needs is exceptional. Constanze keeps us well informed of her marketing efforts and the results obtained. Most importantly, we reached a competitive rank on the Internet that has translated into increased patient activity in my practice!" Troché Fertility Centers realized the impact of improved Google page ranks and taking advantage of their position despite the economic downturn. At the end of 2008, traffic to the site had increased by 110% thanks to countless top 10 Google organic rank results. Within eight months, wvfc.com improved the popularity of the clinics' egg donation and surrogacy program. In 2009, we integrated a complete Spanish version of the website and continue to expand patient volume with Spanish keyphrases. As the clinic continued to grow in 2010, Dr. Troché made his own egg donor database available in an online password-protected database May 2010. This tool makes it convenient for patients to browse the clinic's donor availability. It also makes it more convenient for the staff, who has less work in getting patients access to donor files. In Fall 2010, the clinic was further expanding and opened a satellite office in Scottsdale, AZ and the centers name was changed from West Valley Fertility Center to Troché Fertility Centers. To meet the increasing flow of patients at the two locations, a new physician joined the team in August 2011. With an increasing volume of mobile users of the site, Fertility Marketing redesigned the site in January 2013 and made the site fully adaptive for all platforms. As a result, increased organic search traffic and patient requests was made possible.